The Finance Ministry launched an app for consumers to check the rates applicable on goods and services under the new tax regime. The app, which is available on the Google Play Store, will soon be made available for iOS users. Though a number of similar apps are already available for download on the app store, the GST Rates Finder is the newest government offering. After reviewing several apps, we created a list of the best GST rate finder and GST calculator apps. GST Rates Finder: This app doesn’t require online connectivity. It is simple to use as everything is listed below just two sections — ‘Tax Rates: Goods’ and ‘Tax Rates: Services’. Under each section, the app shows sub-categories of rates and a full list of all the goods or services that come under the respective tax slab. The app, published by CBEC, has a simple classification of GST rates applicable on goods and services. The various rate slabs displayed are of 0%, 0.25%, 3%, 5%, 12%, 18% and 28%. Each slab’s subcategories shows an exhaustive list of commodities or services. The app is primarily aimed at individual consumers who want to check or verify the GST rates on a certain good or service. CBEC GST: The App is available for download on the Google Play Store and also on the cbec-gst.gov.in. 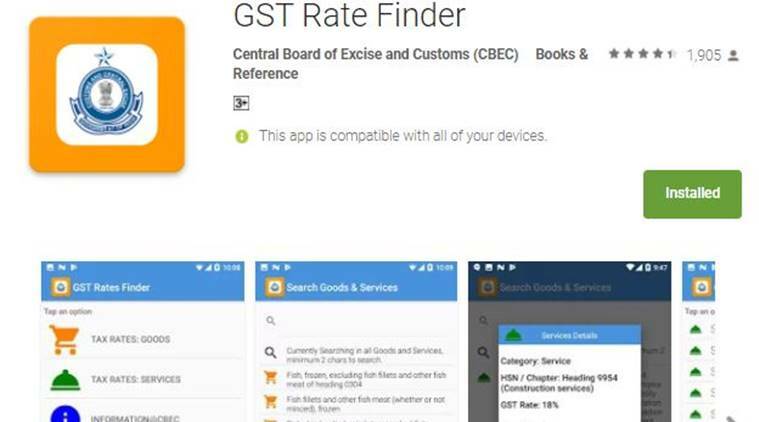 The app, published by CBEC, is more detailed than the GST Rates Finder app. It provides chapter-wise lists of GST Rates, Integrated GST exemption, concession lists, revised thresholds, composition levy etc. It also shows the Harmonised System of Nomenclature (HSN) code associated with each good or service. The app works offline but it doesn’t navigate back to previous menus without closing and reopening the app. Its appearance and functionality are simple, and can be easily used by anyone. The app also has a section of GST Acts and Rules, instructions for migration to GST, GST assistance and more. “A taxpayer can search for applicable CGST, SGST, UTGST rate and Compensation Cess on a supply. The search can be made based on description of goods or services or HSN Chapter or section or heading number. These initiatives are aimed to serve as a ready reckoner on GST rates,” the ministry of finance had said in a series of tweets after the app went online. There are other apps on the Play Store too that are offered by private developers. After checking several offerings, we narrowed down to the following apps. GST India by WebMyne Systems Pvt Ltd.: This app has the standard classified system, but it is integrated with a bill calculation tool. So if you are wondering how much a piece of clothing will cost you after GST, you simply have to enter the price of the item and the tool calculates the tax applied and final selling price. However, this app loses out as it doesn’t offer a detailed listing of all the items that come under GST. As a result, some of the calculations may be off due to the minute details of the law and the sweeping nature in which the app calculates GST. GST pocket guide by Tax Genie: This app requires online connectivity to function. It is targeted less for individual consumers and more for CAs and small or medium business owners. The focus of the app is an exhaustive listing of HSN/SAC codes as well as a GST calculator tool which features options like Description (family, sub category and individual item type), HSN Code which determines updated rate applied on the family, the place of origin (From State) and the destination State (To State). One enters the price per unit and quantity of units and the app calculates the Cost Value, GST/IGST value and the Total Value (Cost Value+GST/IGST).